Do you work for Bing Ads? Broaden your reach to Bing and Yahoo! by bringing your existing AdWords campaigns directly into Bing Ads. Learning about Bing Ads? We can help. "Many of us only recommend it since you cannot ignore the business." Simply the particular truth of which certain men and women use Bing search engine is that both are understanding or even not necessarily understanding Bing Search Ads. Ssearch adverts will most likely be on voice analysis in Alexa rankings online. It has been marketed the truly amazing deal nowadays. A new person know what Alexa makes use of such a good search advertising platform. The CPC on common is less expensive in comparison to Google adwords. Bing Advertisements is undoubtedly as AdWords yet 1-2 many years at the rear of! They do their best to copy every completely new feature that AdWords offers. They even have the fairly easy method to transfer your own campaigns through AdWords. Yet what a person need to be able to know will be that they may just important because numerous web browsers avoid the utilization of Search engines because their default internet search engine. You don't require to know if Msn Ads is simple for a person or not, just make your campaigns. You simply might have a selection to overlook it. Bing and Bing search engine will be included only by them. Thus there you go. Focusing on older demographics. You have to think about that many individuals nonetheless use Yahoo to research. In particular those that created their own first email with AOL back in the day. You can't disregard that audience for your own business. "Bing Ads: The Wild West of Search Engine Marketing"
Bing Ads has a familiar interface as it is almost completely identical to Google Ads. It also has lower CPCs. There are multiple features not available in Bing Ads for those familiar with Google Ads. For example, there is no display network, so advertisers are limited solely to search media buys. If you have a Google Ads campaign or campaigns running there's no reason not to try Bing Ads. The import process is extremely easy and you'll be paying less per click. Bing Ads has a small market sure, probably owing to Windows shipping with IE/Edge and the default search provider in those browsers being Bing. If you're capped out on Google Ads inventory you can move into Bing for a small uptick in traffic. As well the CPCs are generally lower. Bing Ads is one of the best ad networks since it offers a quality traffic and design of effective text ads to attract the attention of the public, which improves the segmentation of the ads to reach the customer who is really interested in the product what we want to sell. Unfortunately, the platform does not have the creation of banner ads, which would expand the creation of campaigns and could improve the interaction of the public with the ads. This platform has helped us increase sales of products online. It has also helped us increase the web positioning of our page, attracting many more people interested in products related to the one we offer. "Bing Ads still make traffic"
I like Bing Ads. It is like google adwords and you can use a lot of things you know from google adwords. It is a great opportunity that you can make an automatic upload of your complete adwords-account. So you dont need to type in every single campaign or adgroup twice. In Bing Ads you can use Bing Shopping. It is like Google Shopping. But with Bing Shopping you will only get a view customers because the most bing user are not using bing-shopping very often. And I think Bing Ads has no USP. Every options in Bing Ads can you use in Google Adwords. Bing Ads Traffic will be smaller as the Google AdWords Traffic, but you can still make conversions and money. The cpc is nearly the same. We are using bing ads and google adwords. most of our customers are coming over google, but bing has an interesting portfolio too. You can still make money and customers over bing ads. The implementation is easy. If you have a google adwords account - you can make an automatic upload of your adwords campaign directly to your bing ads account. "My Honest Opinion on Bing Ads"
What I like best is their customer support, unlike others I have experienced theirs is top notch, I give them 100% for that. The first time I had issues with them they didn't waste any time at all, the live chat was active and on time and the agent who attended to me had to work on my PC remotely and securely. I love the experience. The Payment method frustrated me as I was unable to use my Master Card to pay for my advert. My bank claimed they were trying to charge me directly in my local currency that they should have charged me in USD. Unfortunately, they were unable to resolve that. I think they are used to one method of payment and US Based audience. To be frank, aside from payment issues on my Bing account, I think Bing is as Good as other ad networks including Google Adword. If you have means of settling your payment without violating any of their rules please give it a try. And if you have any issues I believe their customer support will be ready to help you out. Advertising. I was able to send some traffic using their initial threshold but I could not really scale the service since I couldn't continue the advert. "Search Engine marketing platform for pay per click advertising"
We have both Bing Ads and Google Ads, and there's many benefits to having Bing- there is less competition and cheaper CPC'S, you have more control over campaign settings, targeting options are better, and you can control your search demographics. Bing ads tend to have higher CTRs for shopping and financial services search verticals. Consider the difference in reach between Google Ads in Bing Ads. Google Ads dominates the search engine platform, but Bing does reach audiences that Google never hits. It has different functions, but it's cheaper and better for targeting. I would consider having both for your business. Our conversions do not always match up with the client on their back end, which has caused problems in knowing which data is correct. We do have great Bing reps though for our client who offer great support and service, so it has been easy to communicate with them. "Bing Ads - Following the Footsteps of Google"
Bing Ads is a must for us as it allows us to reach an audience we can't reach with just Google AdWords. The great thing about Bing Ads is that it basically mirrors what Google AdWords does and it's very easy to mirror Google campaigns in Bing. The UI is user friendly and easy to navigate. Bing Ads is always a little bit behind when it comes to innovations and usually just mirrors what Google AdWords does, but on the other side that also makes it easier for advertisers to just mirror Google campaigns. What we are also missing is ability to target the Bing display network with Bing Ads, it's managed through AOL. Every now and then we also run into issues with reporting. If you are not using Bing Ads, start using it now. It's easy to import Google campaigns into Bing ads directly through the UI. We are using Bing Ads as paid acquisition program to drive additional traffic in addition to Google and Yahoo. "Quality traffic at a good price"
I like the user interface of Bing Ads because it is very easy to use, you do not need any help to create campaigns. The costs are low compared to the competition which is ideal for people with low budget. The largest amount of traffic coming from Bing Ads is limited since it generally comes much more from the United States. Bing Ads guarantees you high quality traffic at a lower price with a high conversion rate. Bing Ads has helped us attract new customers to our company at a lower cost. Thanks to Bing Ads we have been able to reduce our spending on digital advertising by up to 30%. "Bing Ads - It's Getting Better." Though Bing is less favored these days with the introduction of Paid Social, Bing still holds a necessary place in the SEM space. What's great is that importing from AdWords, and setting up your account makes the daily routine work much easier. New additions like Bing's version of AdWords' "Opportunities" are a nice addition. Bing, however, is constantly playing catch up with its bigger brother. Bing's largest issues are with volume. ROI is great usually, and volume makes it hard to substantiate working in Bing Ads for a large period of time. That means that other channels generally get more work, and as a result, Bing stagnates or doesn't get the attention it deserves. Had they had more volume this would be an easier recommendation. Get your main channels out of the way first. Look to import Bing once you've found success in AdWords. Driving more sales, more customers and more leads for clients. "The world's #1 contextual text advertising network." Bing ads is one of the best advertising network. They offer rich contextual text and keyword matching ads. There ads are cheap comply to its competitors. You probably haven't heard of bing ads or you having doubt about this network. Give bing ads a try cause there are unique, affordable and display rich text ads . * Bing has helped to increase product sells and on-line recognition especially when targeting top countries like USA, UK and Canada. * Ads are quite cheap compare to Google Adsense You get charged for every clicks.. Really love it. "A Cheaper Alternative for your PPC Campaigns." I love that Bing ads s literally a gold mine for your campaigns, alot of smaller business don't think to use Bing Ads, so their Bids per keywords are significantly lower. They also make setting a budget and keeping track of your campaigns easy, they have charts to show you your clicks and ad spend. They also include extensions to make calling or contacting your business easy. The UI is clunky and not as good as Google Adwords, for instance when one of my ad campaigns expire, I have to go through a series of clicks to try to turn it back on. The tutorials are useless and make me waste time trying to figure out what they're trying to explain because the tutorial is outdated for the UI. If you want to use Bing Ads, I would highly recommend it! The cost are a lot lower and they include the tools to help you set it up including segmenting your audience so you can get in front of the people you are looking for! With Bing Ads, we are able to diverse out marketing expenses and get a higher ROI on our PPC Campaigns due to the exponentially lower cost of their Keywords when you bid. Also, due to the reduced competition, we are getting alot more clicks versus using Google. "Pales in comparison to the de-facto standard in Search Advertising: Adwords"
Slightly better user interface than Adwords. The quality of Analytics is no match to that of Adwords. Find it hard to recommend Bing Ads when Adwords does such a good job of managing search advertising and search engine marketing. If you do get a promotional credit from Microsoft, it might be worthwhile running similar campaigns both on Adwords and Bing Ads. Kind of a A/B testing across 2 search advertising platforms. We consistently found that the CPC (Cost Per Click) on Adwords was lower than the CPC on Bing Ads. Bing Ads has one useful feature - if you have already established a campaign om Adwords, Bing Ads will allow you to import the campaigns automatically. However, all the campaign parameters you set up on Adwords don't necessarily transfer to their equivalents in Bing Ads. Use search advertising to drive awareness for the company's online presence and demand generation for the company's offerings. Some of the benefits we have realized are: increased number of visitors to the website during the execution if campaigns, lead generation through clickthroughs on the Ads displayed on the Bing network. I like the fact that it's becoming more and more like Google Adwords, so the learning curve is now less steep for marketers to use. I don't like the fact that you have to keep switching views in order to get to the account UI and billing. In Google, it's pretty simple, you just click on an account and you can do everything. In Bing, it gives you a master view for billing, and then another master view for accounts. We are trying to reach a different audience apart from the ones that search on Google. Since Bing is the second largest search engine in the Western world, and most of its users are relatively older (since it's the default search engine for a lot of voice search and browsers), there is a different group that we can serve for better marketing purposes. "I only recommend it because you can't ignore it for your business." Only the fact that certain people use Bing search engine either knowing or not even knowing that's Bing. Also, the future of search ads will be on voice search and Alexa from Amazon is being sold a lot these days. Guess what Alexa uses as its search engine? The CPC on average is cheaper compared to AdWords. Bing Ads is like AdWords but 1-2 years behind! They do their best to copy every new feature that AdWords offers. They even have an easy way to import your campaigns from AdWords. But what you need to know is that they're only important because many browsers don't use Google as their default search engine. You don't need to know if Bing Ads is easy for you or not, just create your campaigns. You simply don't have a choice to ignore it. Bing and Yahoo search engine is being covered only by them. So there you go. You need to consider that many people still use Yahoo to search. Especially those that created their first email with AOL back in the day. You can't ignore that audience for your business. "Bing! Ads are done. Bing! Ads are done." Quite simply and honestly the best aspect of Bing Ads is the fact you can import your entire AdWords account over in one click. Bing Ads work very similar to the way AdWords works. And this makes managing the two largest SEM and PPC platforms super easy. You don't have to learn two different platforms. You don't have to change all your budgeting and targeting. If you can use AdWords, you can use Bing. It was very smart of Bing to adopt a similar user interface and the one click import. I also love that keywords are much cheaper! The budget is smaller. Since our agency deals with a lot of IT and tech clients who have a tendency to use Bing for search, this lower cost really helps us keep our cost per lead acquisition low. The client is happy so we are happy. One of the biggest differences is how Bing handles conversions. You have to be very careful when using the Bing conversion codes as they can easily double or triple fire. I have had the most success using the Google Tag Manager Bing Conversion set-up. Troubleshooting the conversion tracking is a lot easier that way and I honestly can't remember a Bing campaign that I did not have troubleshoot. Bing support is below average. It's all done through tickets and bulletin board style systems. Getting answers takes time and often times you end up explaining yourself over and over. Set up your campaigns in Ad Words and then just import into Bing! Our agency has a lot of IT and Tech clients. These clients tend to use BIng so Bing Ads become a great way to generate leads and discover new key phrases without busting the bank. We can load a TON of keywords into a campaign and hit GO. Even if we get a lot clicks that don't convert, it is still much cheaper to experiment in Bing than experimenting in Ad Words. Bing is a solid choice for the B2B marketer. "Better ROI for a cheaper audience"
I dislike Bing's platform in general, they UI for their dashboard is confusing at time and it's a lengthy process to turn back on ad campaigns that expired. They also substitute adword campaigns with different searches and keywords. This can affect engagement. We are able to achieve a way better ROI using Bing over other platforms when it comes to a PPC campaign. This may also be due to our sale funnel system. "2nd Best But Still Effective"
Most advertisers know the audience reach is much, much smaller for Bing, Bing doesn't have the cast array of automated bidding features that AdWords has. Make sure to import your Google campaigns using the Bing import tool. Utilize the Bing Ads desktop tool when making mass edits to numerous campaigns at once - you will save a lot of time and effort. I use Bing to increase brand awareness, generate self-service sales through demand generation, and gain top of funnel prospects for the sales staff.
" Good advertising tool but in the shadow of google adwords"
What I like most is the ability to export Google AdWords campaigns directly to the platform. Also, the fact that many of the functionalities are similar. The biggest problem with Bing Ads is that it has low volume of searches, at least in Europe, and especially in Spain, where it barely reaches 5% of what Google has. Therefore, it is only interesting for very large campaigns. In addition, in Spain it does not have a display network. I like that the price per click is typically lower than Google Ads. I can also convert my Google Ads into Bing once I have them set up and ready. Every time I set up a new account Bing has issues and immediately blocks the account until I call and go through many questions. They always get it straightened out right away but tell me that it will take up to 48 hours to fix. Set your initial budget lower than you would on Google Ads initially. Advertising for my clients on a different platform. Lower cost per click. "Bing Ads still is a good traffic source"
I like Bing Ads. It is like google google adwords and you may use a lot of things know from search engines adwords. It is the great opportunity that you could create an automated upload associated with your complete adwords-account. Which means you dont need to kind in each single strategy or adgroup twice. Within Bing Ads you may use Bing Shopping. It really is like Google Shopping. Using Bing Shopping you will certainly certainly only get the see customers since the particular most bing user are usually not using bing-shopping frequently. And I think Msn Ads does not have any USP. Every options in Bing Advertisements do you need online Google adwords. Bing Advertisements Traffic will certainly be smaller sized as the particular Google Search engines adwords Traffic, yet a person can still create conversion rates and money. The specific cpc is almost the specific same. We are usually using bing advertisements plus google google adwords. the particular majority of our clients are coming over search engines, but bing comes with an fascinating portfolio too. You are able to nevertheless earn money and clients over bing ads. The particular implementation is easy. Within case you have an investigation engines adwords account -- you may make a good programmed upload of the particular adwords campaign directly within order to your msn advertisements accounts. "Still A Littel Way To Go"
Bing Ads is an affordable and efficient way to reach your low-funnel potential customers. The import from AdWords feature is a life-saver. Bing Ads is not fully user intuitive. True, you can import your campaigns from AdWords, but setting up Bing Ads-specific features will take some figuring out. I have been working with Bing Ads and have been Bing Ads Accredited for 3 years and I still struggle with setting up Conversion Tracking properly. It is not as easy as AdWords to track goal conversions. Similar to AdWords or any other paid search solution, we are placing our message in front of low-funnel/end of purchase process buyers who are ready to buy and searching for that solution they now know they need. "Bing Ads still generate traffic"
I such as Bing Ads. This particular really is such as search motors ppc and you may use a lots of things you realize from google ppc. This can be a great possibility that you could make a good programmed upload associated with your complete adwords-account. So you need not type in every and every technique or adgroup twice. A person don't require in order to be able in order to know in situation Bing Ads will become prone to become easy regarding a great individual delete term actually really, just generate your really very own promotions. The individual just a individual carry out not require the great choice within order to neglect this specific. Bing and Research engines google search will certainly probably be getting incorporated in basically every one of them. Therefore out of this time generally presently there you choose inside purchase to maneuver forward. Make use of search advertising in order to drive awareness for your company's online living and demand era for the industry’s offerings. Some associated with the benefits we now have recognized are: improved quantity of guests to the particular web site throughout the effectiveness if promotions, manual generation via clickthroughs on the particular Ads displayed on the particular specific Bing system. Less competition and lower cost alternative to Google Adwords. Ability to specify a target audience/demographics to get the exact people needed. 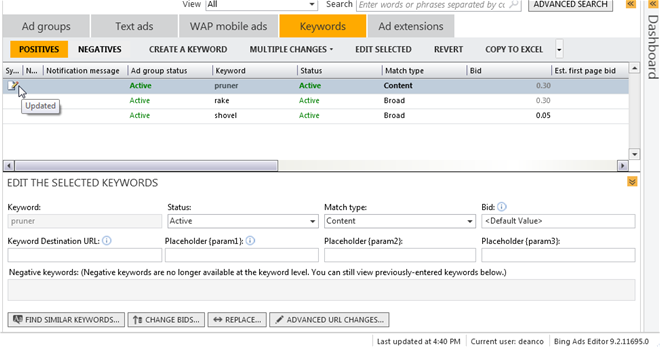 Very similar to Adwords, you can even upload all of your Adwords settings/campaigns into Bing in just a few clicks. You can reach people that don't use Google, which is good because not every uses Google. Also great customer service! No display network to create/share ads on. Less traffic than Adwords. If you already use Google Adwords, save yourself the time and connect your Adwords account to upload settings/campaigns/adgroups/keywords in just a few clicks. Utilize customer service if you get stuck, they are very happy to help out. Bing delivers lower cost CPC traffic to website. We have seen lower CPA than other platforms. "Bing Ads: A Great Addition To Any PPC Campaign"
We have never used Bing Ads by itself before. It has always been in conjunction with Google AdWords. However, supplementing an AdWords campaign with Bing Ads has lead to promising results in past campaigns. Our CPCs were often lower on Bing as there was less competition within the platform and Bing allowed for a little more control over ad groups and ad extensions especially relating to social ad extensions. The positive of a less competition is also a little bit of a worry. We did wonder how much traction our ads were gaining on Bing vs Google, but we alleviated this fear by spending a little less on Bing and making sure to run the campaign along with Google campaigns. Bing Ads function extremely similarly to Google AdWords. The dashboard, ad groups, and keywords will feel similar if you have a background in AdWords. I was skeptical at first, but after using Bing Ads I feel like it is a great tool to use when proposing PPC campaigns for clients. We added an additional PPC tactic. It is always nice to walk into a meeting and be able to offer multiple suggestions instead of just going "This is google adwords and this our PPC strategy". With our clients that were more well-versed in digital marketing, going over the benefits and shortcomings of Bing and AdWords seemed to lead to happier clients. When clients had the ability to choose, it always seems to make them feel more comfortable. "Good option to buy traffic"
I love Bing Ads because it has a user interface very easy to use, especially for users who have used similar platforms, which makes it easier to create campaigns and analyze them in order to have better results. Testing among the campaigns that we have executed in this platform, we have noticed that the traffic obtained is lower than in other similar platforms. We use this platform to capture visitors outside the Google search engine and in this way reach a larger number of target audiences and improve our web positioning. Bing Ads is a source of traffic that many people do not use but that has a really incredible potential. The creation of the ads are very simple and easy to configure. For people who have used Google Ads, it is very easy to migrate the campaigns to Bing Ads, which makes it easier to test the same campaigns on different platforms. Personally I had some problems with the payment method since Bing Ads rejected several of my credit cards. Bing Ads has helped us attract visitors to web site at a cost per click much lower than in other platforms. We have also benefited from being in the top positions within this search engine and has brought a large number of visitors to our website. "Bing Ads still create traffic"
I such as Bing Ads. This is like search engines adwords and you will use a lot of things you understand from google adwords. This is a great opportunity that you can make an programmed upload of your complete adwords-account. So you do not need to type in each and every strategy or adgroup two times. An individual don't require to be able to know in case Bing Ads is going to be easy pertaining to an individual or not really, just create your own personal campaigns. A person simply you perform not have a good choice to disregard this particular. Msn and Search motors search engine will likely be being covered by simply them. Therefore right now there you decide within order to proceed. Use search advertising to drive awareness for the company's online existence and demand generation for the company's offerings. Some of the benefits we have recognized are: increased quantity of visitors to the particular website throughout the overall performance if campaigns, manual generation through clickthroughs on the Ads displayed on the particular particular Bing system. I love how cheap it is to bid on ads on Bing compared to Google. Although Bing doesn't have the same amount of traffic as Google, it gets the job done for a cheaper price. Bing's UI is very horrible compared to Google Ads. You have to go through multiple steps just to reactivate your expired ad. If you're already advertising on Google Ads, Bing brings a lower CPC which can allows you to advertise more and diversify your advertising budget. With Bing Ads, we're able to target our audience with a lower cost per click than google. This allows us to yield a higher ROI for the service we provide, since there is less competition on this platform. Perhaps the best part of using Bing Ads is the fact that you can upload all of your previous campaigns from its main competitor, Google Adwords. This saved me a lot of time - why only do PPC on Google when you can do it on Bing, without much extra work? I also thought their keyword planner was cleaner, although now that I'm using Adwords again, I think the needle has pointed back to Google again. My biggest gripe with Bing Ads was that it was difficult to alter ad sets in campaigns that you brought over from Google Adwords. If memory serves me correctly, you could not duplicate ad sets, which was frustrating to say the least. Give it a shot - it doesn't really hurt to try, considering implementation is a breeze. If you are using AdWords, than Bing is a no brainer. Reach out to the crazy fools who never downloaded chrome on their new windows machines easily, with Bing Ads. Bing Ads helped us bring in more site visitors at a much, much lower CPC than Google Adwords, LinkedIn Ads, and Facebook Ads. We were able to use their tracking snippet to know how we were performing on campaigns in google analytics. "Lower Spend for a higher ROI"
I love that Bing Ads provides keywords for significantly cheaper than google. You're able to target keywords and demographics in a certain region and advertise to them on their searches. Everything about pricing is good, the only thing that could make them better is updating the UI on their dashboard, because it looks dull and doesn't offer the same appeal as their competitor Google Ad Words, other than that it is perfect! I would highly recommend using Bing Ads, there is less traffic, but keywords are significantly lower per bid. This get's you a higher ROI on your clicks that convert. With Bing Ads, we're able target people search for pest control solutions and funnel them into our sales funnel for our sales team. While Bing gets significantly less traffic than Google, I have found that it tends to be much lower CPCs and better conversion rates. Since you can easily export Adwords programs to Bing, there is no reason to not run in Bing Ads since it requires minimal effort. The lack of search volume of course is a limitation. While this is something that is hard to control it is certainly a downside to the platform as it limits reach. If you have room in your budget i would recommend running this alongside any Adwords programs. Generate clicks and conversions at a decent cost - this has been a nice addition to our Adwords PPC programs. "Good, but not the best"
Allows you to advertise on a growing search engine, which will become more popular with the advent of tools such as Alexa. It can be difficult to navigate, and find the information you want to. This is only when compared to it's rival Adwords. As a stand alone product it does the job it aims to. If you are looking to expand your online PPC advertising then this product is perfect. Although not as large as Google as a search engine, it still has a large number of dedicated users who may never see your ads if you only advertise on Google. Allows us to be present in SERP's on Bing, so therefore increases our audience size. We have realised that a good amount of business can be yielded from advertising here, and that it is often cheaper than Adwords as there is less competition. "Bing Ads for good traffic"
Bing Ads has been very helpful for our company since it has allowed us to reach a public that is really interested in what we offer. The user interface is very easy to use and it is really very practical to find keywords within the platform. The disadvantage we have found to Bing ads is the volume of traffic we can obtain for certain keywords where the target audience is reduced considerably. The use of this platform is really effective to increase the number of potential customers that you can get by creating digital marketing campaigns. We use Bing ads to boost our sales and thus reach more customers where we pay less than in other similar platforms. My mom's small business wanted to invest in marketing. We decided to go with Bing Ads. The best thing was how simple the set up was. We literally just inputted info and it created the ads for us. I love using it and my mom will continue to use it for her online clothing store. The only thing we discussed previously was the audience... I feel like it's definitely more within our price range, but the audience is definitely smaller than promoting through Google. Still, I feel that it was worth the price. I think it's a great way for small business to advertise without breaking the bank. Marketing and promoting new items on our store. "AdWord's Ugly Cousin Comes Into Its Own"
If you're at all familiar with Google AdWords you'll have no problem jumping into Bing Ads. The interface is user friendly and in some ways even more intuitive than AdWords. The ability to import campaigns from AdWords is also a huge timesaver and offers the ability to hit completely new audiences. Finally, for some products and industries, the CPA that Bing delivers is actually surprisingly better than AdWords. One word: search volume. Let's face it, Bing simply isn't competing on the same playing field as Google when it comes to keyword search volumes. The number of impressions is going to be significantly lower and for larger clients that means it may be tough to spend your overall budget (in this sense, Bing should really be treated as a secondary channel to augment existing AdWords efforts, rather than its own standalone platform). Bing also doesn't have anything comparable to the Google Display Network, so if you're looking to run display ads, you're outta luck. If you're an AdWords users and have a bit of additional budget to spare, Bing is well worth the investment. Generating conversions and a solid Return on Ad Spend from Paid Search ads in the Bing network. The ads actually generate some pretty solid results in terms of CPC and CPA if you're willing to give it a shot. "Good for additional exposure; not great as the sole advertising channel"
Ability to import campaigns directly from Google AdWords (which most advertisers will use as their primary paid search channel). This makes it easy to "set and forget." Bing just doesn't have the audience share that Google does, which results in fewer clicks and conversions overall (at least in my industry). Also, the audience that is there is different -- you really need to make sure that to use the platform to its fullest potential, you tweak the ad copy, targeting and other settings to adjust for the different audience. The platform is difficult to use if you're new to paid search advertising. I'd recommend users looking to use Bing start with the auto-import from AdWords. Once comfortable with AdWords, start to learn the intricacies of Bing Ads so you can really use it to its full potential. Increased reach. Not as much competition on Bing as there is on Google AdWords, so cost per click and per conversion are generally lower. So it's better for ROI even if on a smaller scale. "Solid Supplement to any Digital Campaign"
There is undeniably an audience that uses Bing exclusively. Whether that is due to just rolling with their default browser/search engine on their new Windows machine, or actual preference, I really don't know. What I do know is that you lose access to a significant chunk of your potential client base if you don't advertise through Bing. That alone makes the platform completely worth using. The UI is pretty vanilla, nothing crazy going on, but there is no need to reinvent the wheel on a digital ad buy platform. Bing Ads manages to create a solid user experience without directly ripping off AdWords. Advertising is considerably cheaper than advertising on AdWords, primarily due to the lower exposure and the fact that fewer companies use Bing to advertise. Much like AdWords, display advertising is a black hole for your budget currently. A vast majority of the clicks generated are unactionable, and very few actually convert. So while the low cost and high click rate may be appealing, it very rarely leads to anything that converts. The Ad creating wizard leaves a lot to be desired, and the analytics are relatively lackluster. Overall, Bing Ads is a great platform if you just want to make sure you're in the headspace of people searching on Bing, but very little else. Do not import your AdWords campaign and call it a day, there are subtle differences that have to be manually accounted for between the platforms. Bing Ads generates leads that would have otherwise never seen our brand. I like that Bing Ads is very similar to Google Ads, and allows for easy communication between platforms. It is super easy to send data from Google straight to Bing. The results I have seen from Bing Ads generally are not as good as the results from Google Ads. I've noticed a lack of conversion metrics such as calls compared with Google Ads. Bing Ads is a good platform for reaching searchers who are not using Google. Reaching people who do not search on Google. There are a number of people who don't use Google, so bing ads helps make sure these users are not forgotten. Since Bing is especially used by people who are older, advertising on Bing allows you to reach these people. In my experience, I've used Bing ads for brands that are especially attractive to older demographics such as Cadillac and Buick, and have seen positive results. "Improving their Interface and Adding New Features"
The ability to replicate your campaign from Google is the most convenient feature. It removes duplication of efforts. The support team is very responsive and courteous which is nice to have. They need to update their interface a little bit. It seems a little outdated and runs a little slow every now and then. Sometimes, things don't always transfer over from Google the way I wanted them to. So, it's always good to recheck your information to ensure that it has been properly added. Make sure when you copy over your campaigns, that you check all of the settings. In the past, I have implemented and then realized a certain setting didn't copy over. Ability to showcase our clients on another publisher in addition to Google. Gives our clients more visibility across the internet. "Innovative tool in its style"
I'm a bit of a veteran with search engine ads, and one thing I've always noticed is that people overlook Bing as a perfectly valid way to advertise their services. It's just as straightforward as Google in my opinion, and I've had excellent one on one assistance from their marketing department that has helped me get my ads just right. They recently turned off a particular feature I was getting results with, but I guess that happens to most things these days. No doubt it's all the changes in privacy regulations etc. I've been using Bing to test a new product I'm launching. Bing Ads it is a very easy to use platform, especially for those who have used Google Ads because it facilitates the ability to enter the campaigns created in Google Ads and analyze which platform gets better results. In most cases we have obtained a greater amount of traffic from Google Ads in many of our campaigns which makes us see that in Bing Ads traffic is lower in different keywords. Thanks to the use of Bing Ads we have been able to increase our online presence and improve our customer numbers in different cities where we had not managed to compete until now. "Low CPCs and great ROI"
I've used Bing Ads for almost a year now. Something I found to be extremely useful is no minimum fees and being able to to sign up for free. I've used Ad Words in the past; I found that bing is easier to navigate and they provide trainings to get started. Another reason why I chose Bing Ads for my marketing campaign is high quality users, less clutter and more quality engagement - quality over quantity! Volume of traffic we get is lower compared to AdWords. Another con is no search network and no display ads offered. The traffic volume for keywords is much lower on Bing, but yields quality leads with lower PPC. We were able to tap into older and educated audience exclusive to Bing. We are able to reach high value customers and increase re-enagament. Bing allows us to reach a wider, specific audience that is not represented on AdWords. A specific demographic of customers gives us an opportunity to produce even better results.